We live in an era in which everything is so politicized that a razor company makes a political statement of its commercials and it’s fodder for heated cultural commentary for a week. Here’s the thing that’s insulting. It’s BS. The whole thing is a lie. It isn’t just “some men” who behave well. Contrary to the commercial, men don’t stand around and watch boys beat each other up. They let boys be boys until it gets out of hand, then they jump in. The commercial also understates the complexity and risk of some of the activities it states are obvious. In one scene, a kid is being chased down a city street by a gang of bullies. The Good Man runs across the street with his young son in town and intervenes. The bullies simply dissipate the moment he steps forward, which is not an outcome on which anybody should count in real life. But more to the point, none of the supposed “best in men” activity is new. Men’s being caring and (yes, I’ll say it) chivalrous is not an indication that the #MeToo movement has changed the world. Being a man is not something different. The mainstream culture has simply spent some decades setting up this strawman about men, and now it’s knocking it down. They aren’t asking for change. They’re simply reasserting what most of us have always understood masculinity to be as if it’s been reinvented and handed back to us by our moral superiors, who are part of the same cultural movement that has been eroding masculinity. I’ve often noted something in response to school shootings and scenes like the representation of one in The Basketball Diaries. I was a black-trench-coat loser, and my big fantasy was never to massacre the other kids. It was to have the chance to protect and save my classmates, and thereby prove myself. To the extent the attitude young men used to have has faded, you did that, mainstream progressives. Don’t now turn around and behave as if the false image of men you created is the invader from whom you’re going to protect the world. Real men will see exactly what you’re doing. …. it repeatedly shows WHITE MEN being sexist pigs and being “corrected” by oh-so-noble minority men. But ANY guy who isn’t a mangina soy boy Bernie bro / Hill shill is gonna toss any Gillette products toot sweet. Oh, I saw that. The essay was already longer than I’d planned, though, and the story is a little more complex. In the ad, whenever it’s a man correcting another man, the more-upright one is darker. But white men in the ad do break up a couple fights. So, I think your point is dead on, but I didn’t want to spend the sentences to dig into it. First, let’s understand that women purchase 80% of “home products”, they are probably Gillette’s biggest customers, not men. For myself, now it is Schick. Perhaps I will go for “designer stubble”. To see “how we were brought up” I recommend a few early morning reruns on broadcast TV. See how Ricky Ricardo is treated by Lucy. How many men get a pie in the face from their wives. In general husbands are hit, slapped, humiliated and made fools of. “Father knows best” may be an exception, I don’t really spend a lot of time with those shows. At the very dawn of my memory are the “Friday Night Fights”, which my father regularly watched. 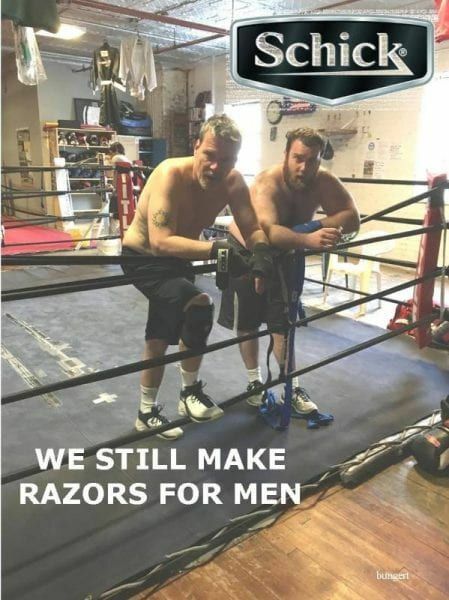 They were brought to us by “Gillette Blue Blades”. Things do change. In the 50’s – 60’s Gillette brought us pugilists, now they bring us “pajama boys”. I did notice that many of the “good guys”, and none of the “bad guys”, where “men of color”. That simply made me think the whole thing was a “construct”. It’s not really a “construct”, Rhett. The ad is not only misandronistically sexist but also racist. ICYMI, there is an ongoing & openly waged War Against White Men by the MSM & ‘virtue-signalling’ SJW-corporate leaders in this country. And isn’t it funny how that ad magically appeared just days after the Am Psychological Assoc published new “guidelines” that basically declare traditional masculinity to be a mental disorder ?? Even as a suburbanite now, I still feel it and do not need articles to inform me. I suppose I am just “old school” male. While prepared to take bullets and slay dragons, I will not clean out the basement, or wash dishes. While not deeply philosophical, I have often thought that female SJW’s missed an important lesson by not having taken a “shot to the head” in the school yard for saying the wrong thing. Therefore, they believe there are no limits. As to “white supremacy”, one need only look to the Mars landing. This does not result in me feeling disdain for the rest of the world’s peoples. But, we are on to something. I remember, being a kid, and my father explaining “bits” to me. I wondered how that would ever fit into my life. Speaking of law school, did you see where RW’s Ralph Pappito just died ?? The poor guy’s life was fricken *ruined* cuz he once “slipped” and used the “N-word” in a private meeting !! “Diversity is our strength” I believe that, I once dated a Canadian. When I first moved back this way, about 15 years ago, I went to India Point for a Viking visit. They had traced Leif Erickson’s route in newly constructed long boats. They had even found Leif Erickson’s direct descendant to lead it. He proved to be a drunk and they dropped him in Iceland. The captain, Ragnar (of course), had some pretty good Viking jokes. The point, looking across the crowd of 350-400, I didn’t see a single face that was even a little black or brown. So much for the cultural interests of the “diverse”. On the other hand, Mozart is more frequently performed in Japan than the U.S.